443 pages | 156 B/W Illus. Even with today’s mobile technology, most work is still undertaken in a physical workplace. Today’s workplaces need to be healthy environments that minimize the risks of illnesses or injuries to occupants to compete in the marketplace. 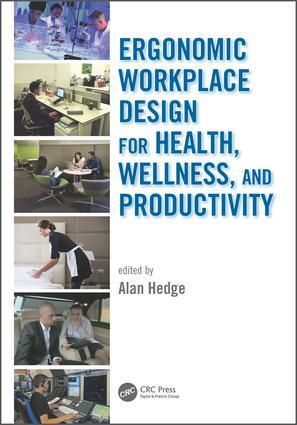 This necessitates the application of good ergonomics design principles to the creation of effective workplaces, and this is the focus of this book. The market lacks an ergonomics design book that covers the topics that this book will cover. This book summarizes design principles for practitioners, and applies them to the variety of workplace settings described in the book. No other book currently on the market does that. "Professor Hedge notes that, even with today’s sophisticated technology, most work is still undertaken in a physical workplace. Consequently, employers must do all they can to create a healthy working environment and minimize the risks of illness or injury to all those who may be affected by their enterprise. The 36 contributors come from academic institutions and commercial companies across the world and their work is divided into sections…"
Introduction to Workplace Ergonomics and Issues of Health and Productivity in Multiple Settings. Ergonomics Design and Environmental Factors. Lighting, Health, and Productivity. Thermal Comfort, Health, and Productivity. Ventilation, Indoor Air Quality, Health, and Productivity. Indoor Acoustics, Health, and Productivity. Indoor Vibration Health and Productivity. Indoor Chronobiology, Time-of-day, Shiftwork Effects on Health and Productivity. Ergonomics Design and Traditional Workplaces. Office Workplaces, Health, and Productivity. Healthcare Settings, Health, and Productivity. Control Rooms, Health, and Productivity. Schools, Health, and Productivity. Universities, Health, and Productivity. Biotechnology Laboratories, Health, and Productivity. Ergonomics Design and Mobile Workplaces. Hotels, Health, and Productivity. Telecommuting Workplaces, Health, and Productivity. Vehicles (Cars, Trains, Airplanes etc. ), Health, and Productivity. Just-in-time Workplaces, Health, and Productivity. Ergonomics Design and the Future of Work. Alternative Workplace Designs, Health, and Productivity. Green, Sustainable Workplaces. Cross-cultural Considerations for Global Workplaces. Challenges and Future Research Opportunities with New Ways of Working. Future Perspectives: Ergonomics Design, Health, and Productivity.